ThunderMAX is a complete, standalone ECM for all Delphi based motorcycles. ThunderMAX is a high-resolution Alpha/N-based system and is the most advanced engine management system available on the market today. ThunderMAX replaces the factory O.E. system with complete clean fitment in current O.E. location and connection to the HD harness. ThunderMAX is a Wide Band, Closed Loop system with Autotune. Tunes What you Ride, How you Ride, Where you ride, every time you ride! Increased throttle response, seat of the pants torque, smoother, and cooler running engine gives the rider satisfaction of performance and drivability. Available for 2001 to 2013 Delphi EFI based motorcycles including Thottle by Wire models as well as 1997-2001 Magnetti-Marelli based H-D motorcycles. 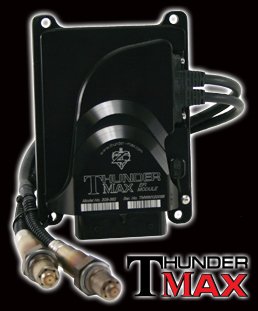 ThunderMAX is proudly made in the USA and comes with a 3 year warranty. 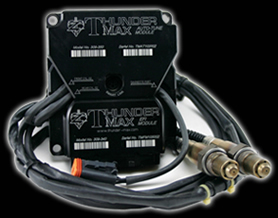 ThunderMAX is engineered, designed and manufactured by Thunder Heart Performance Corporation, a leader in high technology systems and components for the motorcycles Industry since 1996. NOTE: Because of possible clearance issues, some aftermarket exhaust systems may require modifications or relocation of their O2 sensor port bungs. Today, electronic fuel injection is considered to be the industry standard. Many companies have been advertising different types of post fuel controllers as performance solutions. However, one solution that has outpaced all others in true performance since the early days of factory fit EFI is the ThunderMax® EFI System. Engineered by Thunder Heart Performance Corporation (TN, USA) and developed by Zipper's Performance Products (MD, USA), the ThunderMax® EFI system has changed the way consumers ride fuel injected Harleys®. Talking about Thunder Heart Performance and Zipper's Performance Products working together on the ThunderMax®, Dan Fitzmaurice says: "Our alliance with Thunder Heart has allowed us to combine our aftermarket engine experience and performance tuning expertise with Thunder Heart's engineering and manufacturing capability. Zipper's decades of brand equity, revolving around our reputation for high quality, proven results, has helped us successfully market the ThunderMax® brand and turn it into a household name." • Improve the performance and fuel mileage of your H-D® motorcycle without compromising over-all power output. • Have access to make adjustments to your system without a masters degree in electronics and computers. • The ThunderMax EFI System with AutoTune is purpose-built to deliver uncompromising performance, and you dont have to be a rocket scientist to install it, program it or make adjustments. The ThunderMax system is a Wide-Band, Closed-Loop system which means it continually and automatically adjusts your air-fuel ratios every time you ride regardless of changes in ambient conditions, so all you have to do is ride and enjoy! • ThunderMax® with AutoTune is the industrys first and only stand-alone Performance EFI Engine Management System developed specifically to meet the tuning needs of Throttle-By-Wire H-D® motorcycle owners. This highly advanced tuning system allows the user to support a wide range of performance upgrades with ease. • The all new ThunderMax® AutoTune TBW module includes all of the great performance enhancements that made the brand famous, with benefits you will notice immediately, including quicker throttle response, increased power and cooler operating temperatures. td> McChesney Motors, LLC orders the ThunderMax ECM's directly from Drag Specialties®. These kits can be obtained in just a matter of a few days and installed immediately in your Harley Davidson®. Call McChesney Motors, LLC today for exact fitment and installation costs, and to schedule your upgrade.